Hachette Filipacchi Media U.S. pulled the plug on Premiere magazine today, announcing that the April issue will be its last. The company said, as it has in recent closures such as Elle Girl and Shock, that the brand will continue to live online. 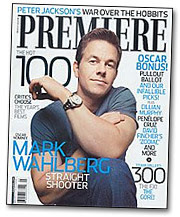 You know I would've wanted to write for Premiere someday as a lifelong goal. I almost feel sad about being an internet film critic and aspiring to do that because we over at the internet are putting premiere out of bsuiness, because i grew up with a passion for print journalism and i hate to see it die out. i just wish we had impending word that premiere was in trouble, becuase we could have had a grassroots campaign to buy more copies of it. Eli Roth Talks "Hostel Part II"
Hudson May Star in "Winged Creatures"
Iran Lashes Out Over "300"
Borat a Human Rights Victim?